Tap tap tap – Is this microphone still on? Well hello there. You, like my students after National FFA/NAAE Convention, may not recognize me due to my prolonged absence. I am supposed to be one those Day in the Life bloggers, you see. My name is Wes. In my defense, I’ve been meaning to write this post for quite some time. Even picked out the title in mid-March. Have had about 40 different possible opening lines mentally composed during idle drives between locations, minus those times the speakerphone has been operating on my phone. And then of course there were all the different topics I considered shareable. So now it is June, and I write this in the final minutes of the last day of the school year. But I am going to get it posted, so it counts in this school year. I am only 90% failing in my authoring duties here. But know that it is my fault, not yours. I am delinquent in the most pressing advice I give my fellow teachers in Oregon: to be sure to tell your story of the great things your program is doing for your students. But what a year it has been. On the ag ed front, the best part of 2017 will be that – in comparison – 2018 should be much more laid back. I have been cursed with good kids who do great work, and have gotten amazing results. So while we may be hustling around National Convention next fall, it is a good problem to have. On top of all this, the ag teacher corps here in ORE have been sprinting a marathon as the legislative session carries on. Three years of planning, preparation, and discussion have culminated in a busy legislative session advocating for increased resources for FFA and Ag Education. Naturally, we have found ourselves seeking funding in a year when our state is facing a $1.4 billion shortfall thanks to rapidly rising expenses to go with the increasing revenue of an improving economy, but what fun would it be if it was easy? Despite the uphill climb, it has been gratifying to see the outpouring of support for ag education and the demonstration of ability of our students in this process. We put hundreds of blue jackets in front of legislators during capital visit days, was complimented on excellent testimony in legislative hearings, and recognized for the strong and statewide presence our supporters have shown during Legislative Road Show meetings across Oregon. While we are 28 days away from the deadline (but who's counting), and the final result is still very much up in the air, we can take pride in the way our Agriculture Teachers Association and communities have elevated the presence and prominence in our state, from our smallest communities to the most densely populated metropolitan areas. So, here’s hoping the Submit button still works in this column (CoP management has probably forgotten I still have a proverbial key, really), and that I can get this post in to count on my tenth year of teaching (a fact breaking betting pools across the land). It was not long ago that I challenged my seventh year to bring it on, and those wide-eyed freshmen students just walked the graduation stage last week. It really takes no time at all. Enjoy the summer all, and make the most of it to sharpen the saw for next year! We'll see you in year 11. Greetings Ag Teachers. After a few...years...of build up, I have finally had time at the end of the school year to conduct a deep(ish) clean of the SHS Ag Room. As such, a number of items have been discovered amongst the layers, file cabinets, desk drawers, countertops, etc - mainly around/in my desk. Please review to see if any of these items below belong to you. What's that? It wouldn't make sense for you to have lost items in my room? Well, it doesn't make sense for several of these items to be in my classroom, but here we are. One red prom dress, in a Loft bag. Not making this stuff up folks. Cardboard box containing 74 individual packages of Sun Chips. Nine commemorative water bottles. All take-home items from various events. Five really important required Professional Development binders. Contents: unknown. But pristine condition. Four cell phone charger cords. I'm guessing some kids are missing those. Algebra I textbook, US History textbook, Civics textbook. Because that makes sense. Lesson planners, 2005-2007. Owner: Veril Nelson...my predecessor. One tape dispenser, labeled 'High School Office'. Except it's not my high school office's. Pleading the Fifth. Pair of black Romeos. Not the same size. Two wall chargers for rechargeable batteries. Batteries not included. Seriously, don't know where they are. SHS End of Year Teacher Check Out Sheet, 2013-2014. Wait, never mind. That's mine. Feel free to inquiry if you wish to claim one of these items. I am rather curious as to where the prom dress came from. Enjoy the summer! Make it count. Disclaimer: What follows below is one-side of a provocative coin: Wes and Matt have taken a topic and then divvied up the ‘Point’ side and the ‘Counter-Point’ side. Neither article necessarily reflects the personal or professional opinions of either Wes Crawford or Matthew Eddy. Rather, the goal is to generate some professional dialog about what a day looks like in the 21st Century to be an Agriculture Educator. Catch Matt’s flip side here. How could you think it should be? Odds are good you fall in one of the two camps above. For as obvious at it would seem to you, I have no doubt you could quickly find an opponent who is as equally resolute. Of course, for 11 months of the year, this hardly matters. We quietly go about our mild business of lesson plans, CDEs, banquets, conferences, meetings, accommodations, state reports, grants, professional development, shop repairs, bus trainings, webinars, and such. And then degree season hits. Granted, as we have already taught our students how to keep proper records, and we stressed the importance of regularly documenting the activities associated with their Supervised Agricultural Experiences, it is such a simple thing to generate a State Degree application and hit print, and it’s done. Right? I’ll let you wipe the tears (from laughter...or crushing realization) before continuing. Rather,it is highly likely the ol’ Ag Experience Tracker (AET) servers require twice the electricity during degree/proficiency season than the rest of the year combined, as students scramble to enter all the cattle feed, fair hours, and long-forgotten speaking CDEs that should have been religiously recorded along the way, but somehow the teenage mind overlooked. That Google Map of active chapters lights up like a Griswold Christmas tree during the month of December. But I bet those are just my students. Surely not yours. Let’s skip the discussion on the suburban-ness of our school particular school district. I could point out that I have exactly two of 135+ students yearly who have parents who are engaged, full-time, in production agriculture. Or the fact that the school district boundaries end at the city limits in three directions. We could pine under the guise of validation that “Well gosh darn it, what else can they do?” But that is not the point, nor is it the basis of the point of view being defended. Our traditional view of Supervised Agricultural Experience can be summed up by simply looking at the list of nationally-sanctioned proficiency awards. Of the 47 awards offered in 2016, a full 27 of them are production agriculture based. To be fair, this is an improvement over a decade ago. But for an industry that boasts 25% of the jobs in the US while only a generous 2% of the workforce is involved in production agriculture, then by our own Intro to AFNR PowerPoint statistics we are highlighting the fact that less than one in ten of the future career positions we are dedicated to filling is in production and yet our largest, best defined incentive area for SAE is nearly 60% production based. Let’s go back to the question - is McDonald’s a legitimate SAE? I’d propose that we decide by looking at what the experience entails. A McDonald’s employee has to 1) acquire a food handler’s license, 2) learn procedures for food handling and preparation, 3) work with a variety of other employees, 4) handle and interact with customers, 5) handle money and orders under pressure, and 6) general employability skills. Let’s compare to a couple other, more ‘acceptable’ SAEs. If the same student is working at a local farm store as a cashier, it is entirely possible that the only task they may have is retail check out. Their responsibilities will be 1) handle money, 2) handle customers, 3) demonstrate telephone skills, 4) and general employability skills. They may never have to have actually know anything technical about the products in the store, but just hand questions to the ones who do. Or maybe they just carry out feed. Or maybe they just sweep the floors. But we would see the job title on the Placement page, and move right along without another thought. At least the McDonald’s employee had to have a certification to get the job. The end goal of the ‘fast food’ SAE - or this AST student - is not to enter a lifelong career into fast food work. But it is hard to argue idea that this student is not currently engaged in a segment of agriculture; it is a bit hypocritical to campaign that agriculture affects everyone who eats if we aren’t willing to be inclusive to those preparing the food, regardless of what the billboard on the building is. I can’t speak to what happens in your state. In ours we changed the name to the State FFA Degree from the State Farmer degree some time ago. That doesn’t demean production agriculture. But looking at a bigger picture - of preparing students for a diverse array of important careers in a future agriculture industry - can be done many different ways now, as we guide them and motivate them to develop themselves with something as a high school job experience that asks “Would you like fries with that?”. READER RESPONSE: Is working at a fast food restaurant worthy of the most prestigious FFA degree earned in high school? For that matter, does the load out job at the farm store count too? Make your case in the comments. It sometimes takes bad things to make you realize the good things. It is no secret ag programs are community programs. More so than most teachers, we all have stakeholders engaged in our classrooms, FFA chapters, and SAEs. It goes the other way as well - we become part of community organizations, leadership, activities, and our neighboring schools. And colleges. But we don't always give credit to the community-building ag programs can do. This is more than adding the Alumni, Rotary or Lions clubs, donors, or others who contribute to your program. It is creating that sense of community in our students. It is opening their eyes to what is possible when a group has common purpose. It is connecting your youngest leaders to the most experienced in your town. It is teaching youth how they can invest and contribute to the world closest around them. It is living up to the fourth line of the FFA motto. It is opening doors to opportunities not for personal success, but for the common good. It is creating the future of your community - the future where people care, where people support, where people make a difference, where bad things can happen and you know we will be okay in the end. We do these things. We can do these things greater. And it is so important. It does not happen enough, in enough places. It is not intrinsic anymore, or guaranteed - it must be taught. It must be nurtured. It must be modeled. It must be built so that when it is needed most, it is ready. This was not my intended first post of the school year. I'm not sure it will even make sense. But I can't describe how it is when something so heinous happens in a building you've sat in, on a campus you grew up with, down the road you live on, where the students you taught were in class. I can't do anything about what happened, but I can choose how to respond, and where I will focus. I choose to contribute, in the best way I know how. And I am so proud of how our part of the world, our towns and our communities, have chosen to respond as well. It isn't always vogue to admit you've moved back to where you came from. I've never been more glad to be from here. And I hope we all live up to the quality of character that has been displayed over the past three days. Don't take for granted the things - big and small - you do for your community by preparing your students. Continue to build that, with the hearts and minds of those who come into your classroom tomorrow. Make the world better because you were there, and because those students were with you. We have been given a powerful tool and an influential avenue with agricultural education and FFA. Use it. We all may need it. My community has been tested. It sometimes takes tough things to make you realize how strong you can be. Our community has proven strong. Social media is not really new anymore; I just celebrated a decade of Facebook last year (okay, celebrating's a strong word). So to call it an innovative marketing tool may be a bit behind the times, but it is something neat all the same. Our Ag Business, Leadership, and Economics (ABLE) class has had a ball with using it to market our plant sale, which is currently in the throes of the event as we write. We've identified hashtags for this year's endeavor - #sutherlinffa and #FFAflowers. We've even gone so far as to use Facebook post boosting on a very limited basis to see what we can accomplish. The clever thing is that you can really target your Facebook audience you want with the tools available, which makes it great to apply those theoretical marketing plans. This means geographics, demographics, interests, and more. Pictures, videos, posts, reshares and more have led to more than one of my students being unfriended by their peers - but loved by their Facebooking grandmothers - I'm sure. But we've also cracked 6,000 post views in the past 48 hours within 25 miles of our greenhouse - and Facebook tracks such data for you! With that, here at the end of the process, I feel like you could also use social media to chart the emotional rollercoaster these 20 students have under gone the last few months. Most are not of agricultural origins, so the idea of raising a crop, tending to all its needs, surviving disasters, and more have been all new experiences. And like other teenagers, they tend to blurt said experiences and feelings to the world. Enjoy the spring. Keep on #tagging. The other day I had the chance to spend time with the newest members of our profession, all attending the Early Career Teacher Workshop hosted by Oregon State University. While I'd like to think I'm not far removed from said demographic, I'm afraid reality and my hairline suggest otherwise. Nonetheless, being there with other OVATA members by the invitation of Dr Lambert & Co was greatly appreciated and enjoyed. It's easy to overlook (read: block out) and misremember those first years for all of us, where every day could be a day you've never taught before, or a CDE you've never brought students to, or the new experience of wrangling students in an airport, or the first time you've had to utilize 911 after a lab, or whatever it may be. And it isn't like we are making it any easier these days. We have all three rings of this circus to worry about, and then we pile on other concepts - like advocacy. It's clear how important it is - it can literally be the difference between agricultural education existing in your school, or being cut. At a greater level, it is the difference between being a part of setting the direction for experiential education and college and career preparation, or being an afterthought. 1 - The Power of the Press: does your Reporter send out results from FFA CDE's, Community service activities, or other news? If this isn't working, take the charge on. It's an easy email to forward or write yourself, and tons of people will see it. 2 - Who's Judging You? Who do you get for speaking judges? Public speaking CDEs are an excellent way to showcase our best. Most people are blown away by the poise of our young people. You have to get judges anyway, so make them people who matter - school administrators, counselors, local community leaders, partners, etc. 3 - Records, Students, Records - How up-to-date are your students' SAE records? The ability of AET to amass data on the economic impact of Supervised Agricultural Experience is powerful - as long as the data is accurate. By making sure your students know how to record their SAE and holding them accountable is a powerful tool in advocating for the importance of Agricultural Education. 4 - Records, Teachers? - Speaking of students, how are your records, Teacher? Do you document the hours you put into supervising FFA and SAE? Can you justify your current extended-duty contract - or the need for a larger one? This is important data. I have gotten lazy about it the longer I teach, but the data would not only serve me but other ag teachers as well. 5 - #agedu365 - I'll steal this one from Matt Eddy, and it is a good one. You can read about it here, and I challenge you to not only use it and Social Media, but are your students using it too? And if you haven't caught on yet, Facebook is to them what MySpace is to you. So where can they use it? We are not going to get everything we need to do done tomorrow. And that's okay. We will continue to do little things to improve our ability to make our case about the importance of agricultural education. Teachers, keep teaching. Do the best you can for your students. And find a couple simple yet effective ways that can communicate the great things your program is doing. And that is advocacy. See you on the road. And then tell someone about it. 6:40am - arrive at school early enough to let a girl get into her locker for her black skirt to make the 7am Rotary meeting across town, where six students received great support to attend the National FFA Convention. 6:50am - delete several emails looking for rodeo/session/concert tickets for a certain October week in Kentucky. 6:54am - appreciate emails reminding folks on how to use technology to connect with people needing/selling tickets for national convention. Then delete those too. 1st period - reset seven passwords to the AET. Because why would we write them down in our notebook last year when we were told to. 2nd period - convince 28 freshmen they want to complete an activity page defining instruments and controls for operation agricultural machinery. Marginal success. But they all do it. 3rd period - run over to the next town to pick up a beef digestive track. Some re-assembly required. 4th period - re-odorize my shop after 32 kids inspect the inner workings of ruminants. Still re-assembling. I've never done a full beef tract in class; usually we do sheep but none were available. A couple hundred awful offal pounds later, no problem. 6th period - meet the Oregon Deputy Superintendent of Public Instruction Mr Rob Saxton in the school office so he can tour our renovated Career & Technical Education programs. This was possible thanks to a Revitalization grant available last year through the Oregon Legislature and the Department of Education. 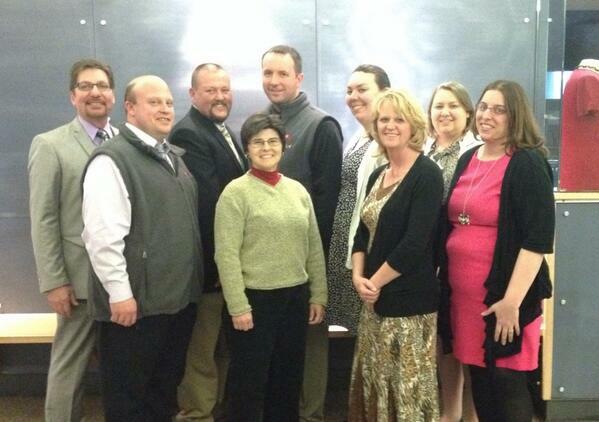 Our school was able to receive over $309,000 for our woods, agricultural metals and welding, and technology programs. Our Revitalization project had over 17 local industry partners sign on to build our CTE programs, and we were excited to have most of them out last week for an Open-House and banquet in the shop facilities (and we even held dinner in the welding shop too ? best dinner they?d ever been to in a shop). Mr. Saxton wasn't available to attend the dinner but graciously arranged to stop in today and see what our students are doing. 4:30pm - Parent Teacher conferences begins. Conversation breakdowns: 25% = what's his/her grade??? 50% = what can they do next in FFA? 20% = what does it take to raise a market steer/pig/lamb/etc? 5% = who is the social studies teacher? 7:15pm - conference slows down, 27 students' parents later. Write a blog post. 7:28pm - feel bad about the terribly 'awful offal' pun earlier, but don't edit it. 8:00pm - Not quite there yet. Stops for a milkshake and gas are likely. Then go home and chase a little boy as he crawls across the floor. Always on the move these days. And easily amused. Must be genetic. Happy fall all. See you in Louisville! READER RESPONSE: what's keeping you busy this fall? So in the past two and a half weeks being an ag teacher has taken me through six time zones. I am not sure I know which way is up right now. First, April began on the East Coast at the National Science Teacher’s Association (NSTA) convention in Boston. I had the great honor of being there with DuPont as part of the National Agriscience Teacher Ambassador program and the George Washington Carver AgriSCIENCE teacher program, along with several other ag teachers from across the states and 14,000 of our closest science teacher friends. Oh and Bill Nye. Although these days with Cosmos on TV, Bill better watch out for Neil deGrasse Tyson taking reign. Good thing they are apparently friends. The neat thing about this conference is finding resources to bolster the ways we strengthen STEM in our agriscience programs. There are huge numbers of resources out there from organizations such as the Howard Hughes Medical Institute, Harvard Personal Genetics Education Project, and others who can provide us ways to engage our students in instruction such as genetics, engineering, environmental science, and more. Agricultural education is a clear nexus and applicable example of all of these areas of instruction. After a busy conference and a quick stroll down Boston’ Freedom Trail to see major sites of American history (Bunker Hill, The Old North Church, the USS Constitution, and the inspiration for the bar for Cheers), it was back on a plane headed west, a crazy six days back at home, and then another hop on a plane, again headed west to NAAE Region I. Which if you know what is west of Oregon, you may question where that could be. (Yes I really took both those pictures). The Hawai’i agriculture teachers, NAAE Region I Vice President Nick Nelson, and WAAE Executive Director Gary Parkert put together a fantastic regional conference this year. Besides the pretty swank backdrop of the beaches of Waikiki, a great program provided all who came with information, ideas, and curriculum to take back to their schools. Along with peeling sunburns and floral print shirts. Sometimes we get so focused on our programs and situations that we don’t stop to think about how they do it in other places. But we had the opportunity to tour Leilehua High School where ag teacher Jackie Tichepco runs two hundred students through hands-on learning by managing several acres of bananas, beans, papaya, hydroponics, livestock, and more. Oh, and the growing season is 365 days of the year. The activities Jackie and her students are engaged in are unique and creative. While the crops and lessons may be different, the concepts of doing to learn in agricultural industries are the same. The novelty of being in a very different part of the world just adds to the intrigue. There is no doubt that April is just about the worst possible time to have a professional conference that pulls you out of school for most of a week. We have three weeks until banquet, five days until plant sale, two weeks of 12 CDEs, and – oh yeah – just a bit of teaching to do. But the benefits of professional development pays back in spades for your students and community. Enjoy the spring folks. Make plans for how you are going to take advantage of professional development. Yes, you’re busy. But it’s important. You got this. So it has been a while since I’ve posted on here. It’s that I haven’t wanted to. It’s not that it the school year is any busier than any other year (but it’s definitely not slower). It's not that we've had umpteen speaking events, community service activities, proficiency apps, or other paper work come to pass. It’s not that state convention is next week. Paul Wesley Crawford joined us on January 23rd of this year. It is amazing how such an event can change your life. This is our first child, and our expectations of a whole new world have been fully met. Such as how simple tasks like leaving add 30 minutes…apparently as does typing up a blog post. Needless to say, a great deal of change has happened in our lives. This is much more true for my wife than I, who is on maternity leave the rest of the school year. However, she is still overseeing the FFA chapter of her program, so that means the child gets hauled around a fair amount. But he is a trooper. He’s seven weeks old and has been to both district and sectional leadership career development events, been changed in 1) the greenhouse, 2) the metal shop, 3) both of our classrooms, 4) lambing barn, and 5) tonight in the car at the land lab. Next weekend he will attend his first state convention. Thank goodness for grandmothers who enjoy time with their grandson! I can’t imagine how life will continue to change. Adapting how I manage the AST program and teach will be a never ending process I am sure. What will summer look like? How will I leave for professional development trainings? How can I give time to my students as well as my family? Can I finally commit to getting a dog now? You don’t realize how much a day means until you watch a person develop and change every day. But for now, it’s another day in the life. So I read that book that came in the mail the other month. I'll be honest, when I received an email last fall from National FFA at the tail end of my prep period saying a free copy was being sent to every chapter regarding the fight against hunger, without paying much attention to who the book was written by, as the electronic note added to the 14,997 other ones stockpiled in my inbox (don't tell my technology director), I didn't give it much thought. And when my copy of '40 Chances' arrived, it looked reminiscent of a trendy Malcolm Gladwell cover, with a nice-short-catchy-title-on-a-stark-white background, and an author's name under the author's name - a sure sign they needed a person recognizable on book to sell it, and a name under that to actually write it, right? But it had actually only sat a couple days when I saw a mention here on CoP about the meaning behind the title - a farmer only has forty chances in their lifetime to get it 'right;' only forty tries of planting, growing, managing and harvesting crops to achieve their best result. And I was intrigued. So in December, I read it. Quickly. And you should to. A closer inspection revealed this is truly Howard G. Buffett's book - and the name under his name in his son Howard W. Buffett, not an assisting nameless author. And quite frankly, these gentlemen know what they are talking about. Beyond the simple and brilliant premise of 'forty chances' and how it applies to the great work he and his family are engaged in with their lives, the even more engaging and complex concept of sustainable agriculture is examined at length, and how we can indeed feed the world. It is clear that Mr. Buffett is an agriculturalist and has the heart and influence of an agricultural educator on a grand scale - passionate about his industry and intent to help others realize the purposes and practices in which we can truly and sustainably feed the world. The more I read the more I appreciated the great work his foundation and others are doing in realistically accepting the hunger challenge on a global scale - while recognizing our own challenges at home - with practical and tested methods. There are a hundred lesson plans in this book, wrapped up in the Buffetts' forty stories. From the global challenges to differing cultures, around inquiry-based approaches to solutions and problem solving or the concepts of organic and genetically modified crops, or the leadership lessons found in his journeys, the applications to our agricultural science classrooms and FFA chapters from this collection of valuable experiences seemed to be written for our profession. While I'm sure every person would gain great insight from reading this, as an ag teacher I was continually blown away by how many times I realized how perfectly it fit with what we try to do every day. How are you using your chances? As educators, we have forty at best and most likely less to make the most of it. I'm already into number seven - the perspective I've gained about what I'm doing this year, this month, or even this week really emphasizes the importance of the today. And just like that one pass on the tractor through the field in that one day affects the whole year's crop - and that farmer' chance - the lesson we taught this morning was our one chance to create knowledge, understanding, and application in our students' minds this year; we may not teach that lesson or unit again until 12 months from now. And for those students in our class today - maybe they will experience it never again. Now how well are you using your chances? No pressure. I hope Mr. Buffett uses every chance to get another person to take a ride in his combine, understand the importance and complexity of today's agriculture, and become another advocate to help in the virtuous and vital mission of feeding the world. I am hopeful of our chances, and I didn't even need to make a pass around the field to be on board. But that is one combine ride I most certainly wouldn't pass up. May your rows be straight and the rains timely, sir. And let us all continue to help every person understand the importance and purpose of agriculture. READER RESPONSE: How are you using your chances to best influence the public and your students? As it is now the week of Thanksgiving, cue the conversations to persist in the teacher break room: "It's so busy this time of year...The kids are all wired up...This month is so crazy..."
Of course, ag teachers say the same thing about a) October/National Convention time, b) Proficiency season, c) fair season, d) state convention season, e) CDE season, f) beginning of school, g) end of school, h) summer, i) spring...you get the picture. In fact, it is too easy to get wrapped up with all the extra things going on and demands upon us that it's not hard to feel overwhelmed, no matter how long you've been teaching. - all on top of the usual hustle and bustle of paper-work, meetings, challenges, and tasks. It's too easy to get distracted by all these other items that we forget what job number one is: educate youth. So when push comes to shove, my classroom comes first. I focus on having great curriculum prepared for great kids. I HATE grading but value the feedback it gives students on how they are doing, so I get it done. I make sure that when the bell rings that I am ready, and now that they are experienced they know they should be ready too. Here we go. So folks, Keep Calm and Teach On. That's what we are here to do. There are a lot of other important things we need to do, but don't lose sight of priorities, regardless of what happens. When your 50 minute lesson plan is complete at 20 minutes, Keep Calm and Teach On. When the Department of Eduction releases its newest/next-generation/common-competency-objectives-proficiencies/latest reform, Keep Calm and Teach On. When you have your kids running around with notched pig ears taped to their head identifying numbering and your assistant principal walks in, Keep Calm and Teach On. When the LCD projector bulb burns out and the overhead stops working, Keep Calm and Teach On. 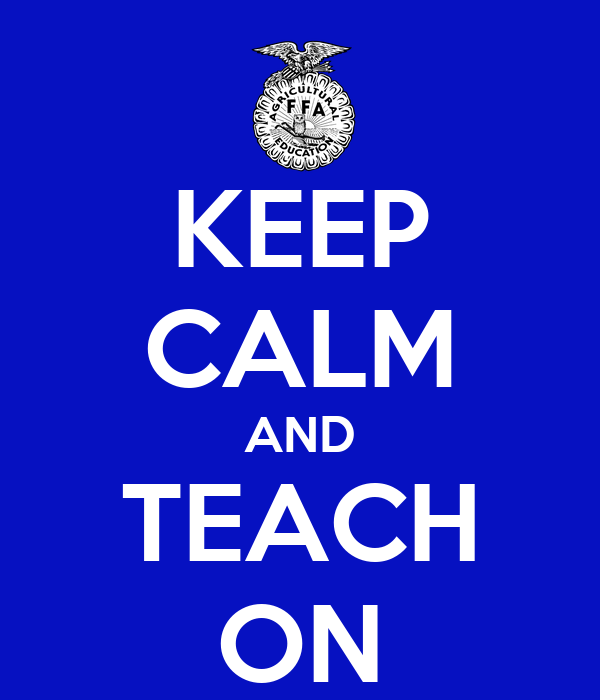 When you are two weeks behind of turning in purchase orders, Keep Calm and Teach On. When the power is out and you teach welding this period, grab the chalk, Keep Calm and Teach On. When you're in charge of three local and regional committees who are all meeting next week, Keep Calm and Teach On. When you've scheduled a trip and the bus is 30 minutes late in showing up, Keep Calm and Teach On. When you get the email saying your re-licensure paperwork is due next week, Keep Calm and get it done so you can Teach On. When you are on a field trip in the middle of nowhere studying rangeland and a student falls fourteen feet into a hole at a BLM recreation site, Keep Calm and call the closest ag teacher who lives ten miles away. Then Teach On. Keep Calm folks. We're ag teachers. Do what we do best. READER RESPONSE: what curve balls do you deal with and just have to Keep Calm and Teach On? Add them in the comments! If you were like me last and week and was actually in the classroom and not waiting for a table in a Joe's Crabshack next to the Ohio River, you were probably still aware that something big was going on. While our chapter has made it to the past three national conventions, we didn't attend the re-inaugural Kentucky convention. As it's a 36 hour drive over 2,381 miles of highway (37 hours in the traffic right now as I Google Maps it), we traditionally don't make the trip unless we have a team competing. And while some traditions are due for a rewrite, we just haven't gotten over that hump yet. However, thanks to the times we are well aware that the National Convention is indeed going on strong. In fact, if you're paying attention, there are all sorts of indicators that 50,000 of your closest friends left you behind and headed to Churchill Downs, amongst other things. 1 - The emails across the US Ag Ed Listserv about concert tickets/opening session tickets/hypnotist tickets/rodeo tickets abruptly stop. I think that if you tallied up the Subject Lines the national listserv is used for (which if you aren't on it, you should be) it would be 1) "Monday Morning Monitor", 2) "Job Postings in (state) -or- at National FFA", and 3) "Need 3 tickets to Opening Session B!" 3 - You get phone calls from community members who are watching it on RFD-TV. "Just wanted to know if you were there, we couldn't find you in the crowd..."
4 - Your Facebook/Twitter feed blows up during the CDE Awards banquets Thursday/Friday. This is what happens when all your friends are ag teachers. 5 - You post your blog on CoP a week after you write it in the hopes someone will actually see it. I had it last week, but figured to wait until people were home. Wishful thinking perhaps. Welcome home all. Hope to see you there next year. READER RESPONSE: What are the signs of Convention in your neck of the woods? There are no two ways about it - when you are an ag teacher, you wear a lot of hats. You collect a lot of hats too, if your conferences and livestock shows are like ours, but that's a bit more literal than what I am referring to. We're talking a bit more of the figurative today. Don't tell me I'm the only one who feels this way. I swear two years of vet school may have been a good idea. As I've gotten older and wiser, I tend to refer a lot of things to the professionals, but in my youth I felt obligated to help with every castration, vaccine administration, and belated de-horning (not a pretty one, that). Live and learn. And pass the AI glove. We're not quite there yet, but pretty soon the senior year meltdowns that begin with "I don't know what I'm going to do with my life!" should commence. But that isn't the first time we help guide students into a direction and vocation. With lots of opportunities for college and career at our disposal, and bonuses like offering dual credit courses, it seems we are always handing out scholarship applications, fielding phone calls for employers looking for employees, or related activities. I certainly feel I've attained the abilities to navigate the nuances of air travel, hotel booking, rental car reservations, and how to best feed 15 people during peak dinner time hours before the next session. Because who doesn't enjoy 30-60 minutes of phone time with Delta Airlines? I've had the jobs, just wish I had the know-how all the time. I have discovered a great deal about about concrete, permits, greenhouse structures, inspections for permits, teaching ten kids how to build a fence, failing inspections for permits, natural gas lines, and eventually closing permits. It can be for as great as tasks as preparing to win a state CDE; it could be as mundane as finishing notes at 8am on Monday morning. It may have been to keep speaking the rest of the Creed. Or to take the tractor out of neutral. 1) Do you have a welding shop? If yes, proceed to question two. 2) Have you ever been asked to fix _____? If no, proceed to question three. 3) You are lying about either question one or two. Please go back and correct. Sure, it took eight kids to round up the three kids running loose. And when they fail, you go out and get them all in yourself. Because you are that good. But you still can't build a fence that will hold goats in. Have you tried water-proofing it? If your fence will hold water I've heard it may hold your goats in. Really, what's the difference? Both involve a rehearsal that isn't taken seriously enough, a ceremony that emphasizes the importance of said rehearsal, and then you eat. Invitations, floral decorations, centerpieces, etc included. I'm sure I've missed plenty of examples of either hats or MacGyver moments - seems like the comments would be a great spot for your suggestions. Enough good ones and I'll make another post of the top submissions. But there is one more role this year is going to add to my plate at the end of this semester. It is an exciting one, but more than a little intimidating. It is going to change my life greatly, and it's a hat that is going to change how I approach all these other ones. I am greatly looking forward to where its going to take us as I wear it, and most likely will require me to reach out to my fellow teachers as I learn to incorporate it with all these other hats we all wear. Here's looking forward to 2014. Advice appreciated. Well, I'm not sure where that summer went to. But for those of us in our part of the woods, school starts tomorrow. And that's why I'm writing this instead of cleaning my classroom. I'm well aware some of you started your new school year a month ago, and for that you have my condolences. Us traditionalists out here in the Pacific Northwest are fortunate that we get to experience the full six-weeks of back to school shopping ads that became moot to you in August. But we tend to not have as long of breaks throughout the year and get out a bit later. So fair's fair. But this is my lucky number seven when it comes to teaching. Seeing it in writing makes it no easier to believe, but clearly time flies when you are having fun. In fact, further reflection realizes that of my last six years, I have been able to blog here on Communities of Practice for half of it. Half of my teaching career. I don't know if that makes me well-established to some of you or woefully young. The good news is, I've blogged about the better half. Your first years as a teacher are like middle school - everyone needs to get through it, and at the time you don't know any better, but once you get through it you realize you'd never want to go back. Even moving jobs wouldn't be the same. There is something magical of making it out to years four, five, etc. Trust me, probies, it's worth making it that far. And beyond. It's amazing what you can pack into three - or six - years. I've not been the most prolific of story tellers, but it is most enjoyable to scroll back up the posts and see where we've been, to realize how far we've come, recognize some terrible one-liners, and reaffirm I still have a long way to go - and I'd better pace myself accordingly. There are times when it flies by, and times when you just have to find ways to entertain yourself. There are days your students amaze you, both with their hands-on ethic, or their answers on tests, and those students who have come and gone. And then there are the days that require multiple pairs of pants. It's been a journey, both down the road with kids as well as with fellow ag teachers, both in business and friendship. But I'm not saying anything you don't know if you are already in this game. And to those who are coming in - welcome. Work is easy when you love what you are doing. Nothing can compare to the people I've worked with and the students I've had. It's been work, but as wise men say, it's work worth doing. It's a trip I'd take again twice, and am just glad it isn't close to ending. Although I'm not sure I'll be so lucky to drive some of those roads again anytime soon. But maybe I'll head that way for a bit longer next time? If the title wasn't clear, we've wrapped up our NZ travels (all too soon) and headed to Sydney for a couple days before we return home. It's immediately apparent a different climate and lay of the land means very different management and style when it comes to agriculture. We're only here a couple days, but strive to make the most of it. This morning we spent it at Hurlstone Agricultural High School, which is well served by its name. This high school sits on a several hundred acre farm that has beef cattle, a dairy with nearly 100 head, sheep, goats, pigs, chickens, greenhouses, animal facilities, paddocks, and a pool. I don't think the pool is there for stockwater. This school is right off the train in one of Sydney's outlying suburbs. According to the conversations we had, the only reason the farm is still in existence is because of the alumni of the school who have gone on and been people of influence, as the farm is right in the middle of prime development land. The other side of the conversation was most interesting. The feeling was that the school had moved to a much more academic focus, and as such much less was done by students with the farm, and the students weren't necessarily there because they wanted to be in agriculture. Ag courses are compulsory in years 7-10, and electives in 11-12. Students do such activities as chick trials, lamb marking, plant plots, and cattle showing, but don't do anything with the dairy and some of the other farm activities. It was an interesting visit, albeit one without any students - the term starts tomorrow. As such we didn't get to speak to as many people as we would have liked but appreciated the chance to visit with the ones we did. It's a unique setup and apparently fairly unique for much of the surrounding area and maybe even the state. It'll be interesting to see how long it survives before urban sprawl wins out. Otherwise, it's been very cool to be Down Under, and see the sights of the city before we head back. The Royal Botanical Gardens are exquisite, with plenty of excellent views of the harbor and other landmarks. And you spend 10 minutes trying to get a picture of the first cockatoo you see...until you keep walking and realize they are not much more than pigeons down here in some areas. Still looking for shrimps on barbies. Haven't seen one yet, but it is winter, mate. Road Report: since we're only here a couple days, no more driving! Thank goodness, because I think I would have died three times over in this town. As it was we've stuck with public transportation, which has been good, minus the fact that all the downtown trains were closed this weekend for maintenance work. Of course. Here's to a lot of walking.